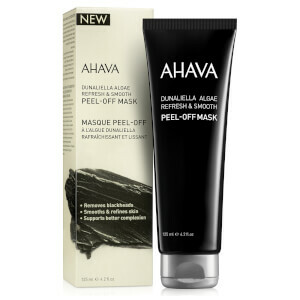 Clarify your complexion with AHAVA Dunaliella Peel Off Mask; a luxurious, ultra-refreshing formula that helps to combat dullness and fatigue. Powered by Black Bamboo charcoal Powder, the revitalising treatment effectively draws out dirt and impurities, whilst minimising blackheads to promote a smoother, more refined visage. Dead Sea Dunaliella Salina Algae (rich in vitamins and antioxidants) diminishes the appearance of fine lines, as it nourishes and rejuvenates for a silky soft, even complexion. Apply a generous and even layer to clean, dry face. Avoid eye area, brows and hairline. Let the mask dry for approximately 15-20 minutes. Smile to help loosen the mask and peel off. Rinse away any residue.